The moment I read about Benoit’s special, one-night-only, 100th Anniversary Dinner, my hand immediately shot for the phone and my fingers dialed the number for reservations. Between the three guest chefs, Michael Anthony, Michael White, and April Bloomfield, they are a 2012 James Beard Winner and share a total of six Michelin stars. When was the last time someone had the opportunity to eat a single dinner prepared by some of the best chefs in NYC? Of course, by the time I called, it was too late and there were no available spots. I put my name down on the waiting list as the only alternative, never expecting to hear back. Two days before the night of the dinner, I received the most surprising phone call. Benoit had open spots for its special Anniversary Dinner! I could not believe my luck in securing once-in-a-lifetime reservations to such a remarkable dinner. 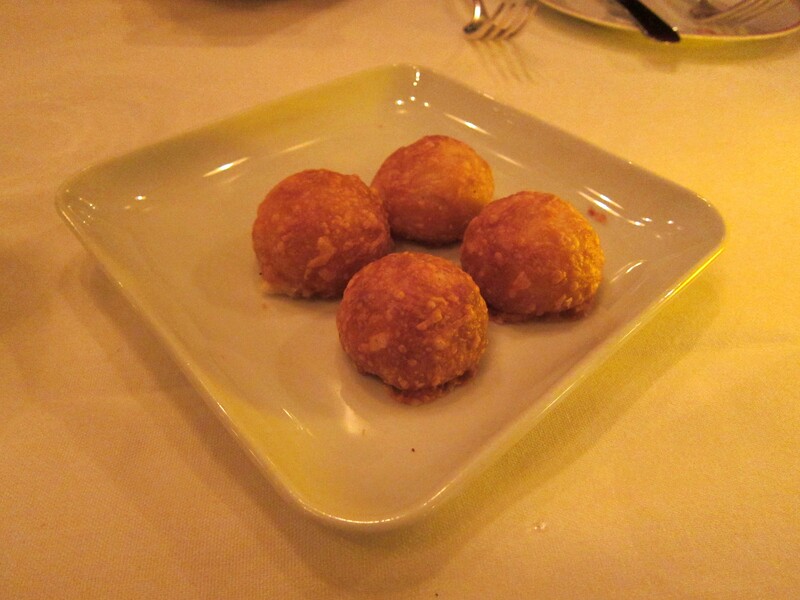 We started off our dinner with a small plate of light cheese puff pastries. The bite-sized pastries had a soft slightly flaky outside and an airy inside that reminded me of finger food at a bar. The first dish of the tasting was from Alain Ducasse and Philippe Bertineau, a duck foie gras terrine with toasted parisienne brioche. 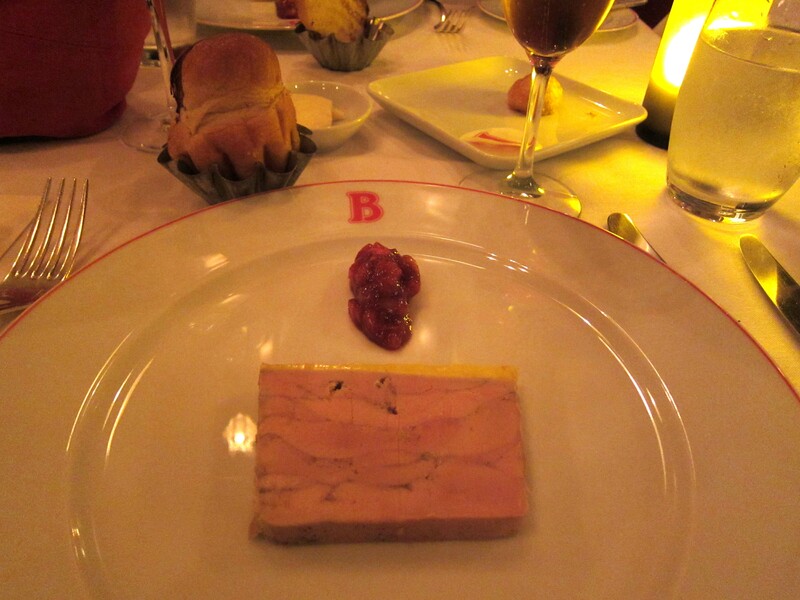 The terrine was soft, creamy, and only had a little foie gras flavor to it. I would’ve liked the brioche to be toasted more so that it was crunchier to contrast in texture with the terrine. A sweet jam could also be added but the dish just wasn’t as exciting or tasty as we had hoped. 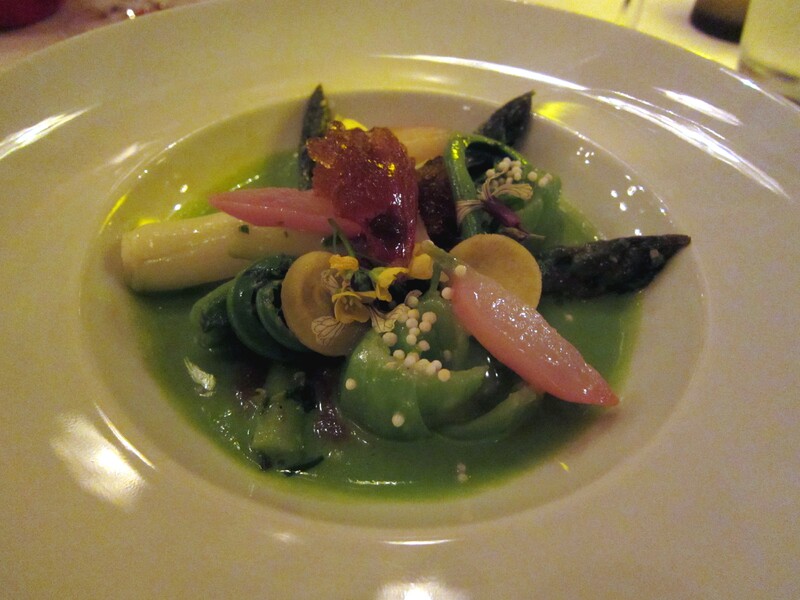 Michael Anthony (props to him for just winning the James Beard award) presented a colorful spring vegetable “pot-au-feu.” The overall presentation with the fleur de sel was very nice and reminded me of a blooming vegetable garden. It tasted very light and refreshing, almost like having a bottle of crisp spring water after being parched. A duck consommé also added a small taste of savory flavor to the dish. 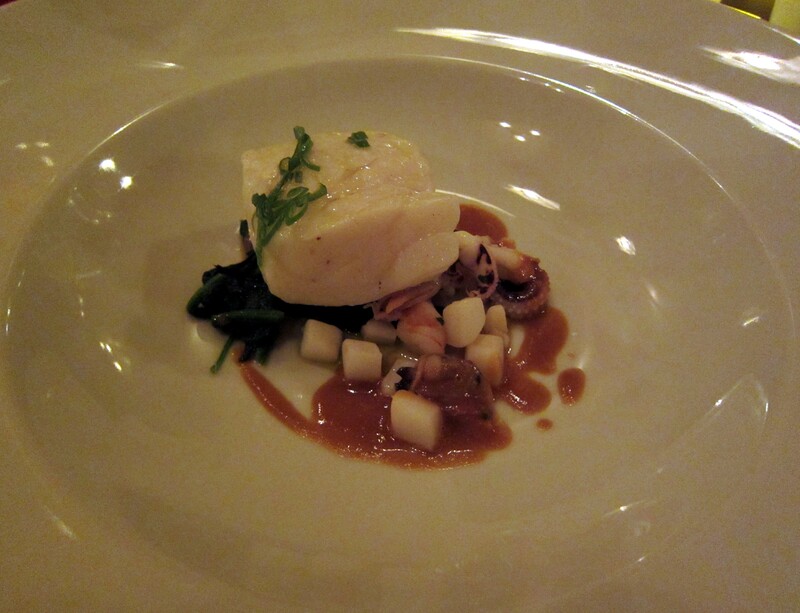 Michael White’s olive oil poached east coast halibut was next on our list. The firm and flaky fish was cooked well on top of the brodetto di crostacei, consisting of clams, shrimp, and octopus. Initially, the dish was a bit salty but the side of spinach added a taste of freshness to balance it out. I also have to point out that the white wine pairing was spot-on as it elevated the flavors of the fish and dish as a whole. 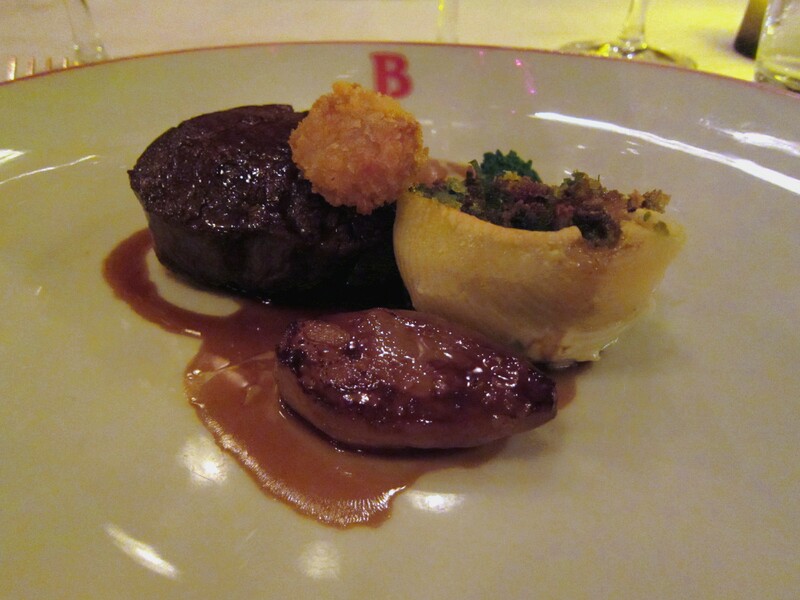 Our last main course was a larded filet of beef with crispy bone marrow from April Bloomfield. A bit excessive? Nahhhh. This was one of my favorite dishes of the night because of the tender filet with strips of delicious fatty lard hidden inside. To make things better, the crispy bone marrow was bursting with flavor that just melted into your mouth with each bite. The vegetable stuffed lumaconi was a nice attempt to be healthier and balance out the absurd richness from the filet and bone marrow. But if you were ordering this dish at a restaurant, I’d say the vegetables would be optional, you knew what you were getting yourself into. Well done April Bloomfield. Our final course was a nougat glace dessert from Alain Ducasse and Jerome Husson. 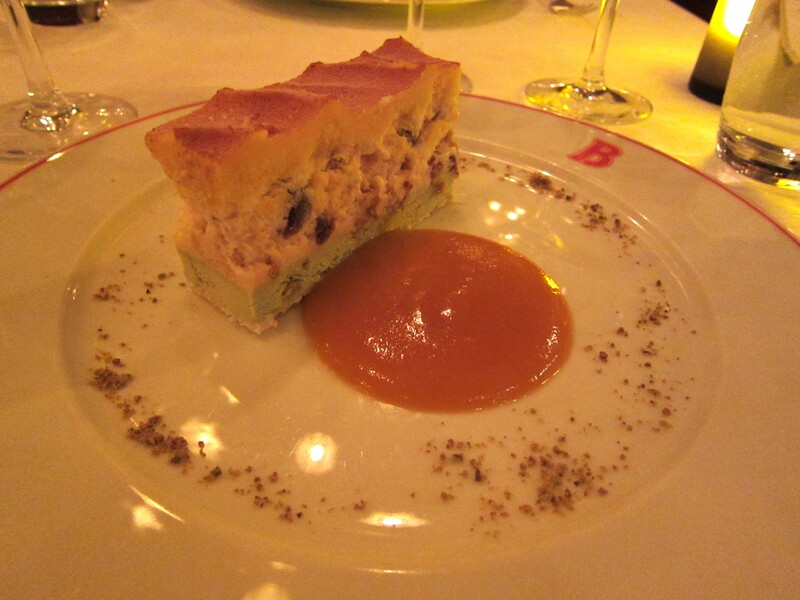 There was intense passion fruit flavor on the dish itself and as the top layer of the cake as a sorbet. The nougat middle layer had a creamy taste on top of a final layer of pistachio ice cream. Both layers added nutty flavors and texture to the dessert. For such a highly anticipated dinner, it was no surprise that the atmosphere was very busy. As a result though, service suffered a little, but there were no big mishaps during our meal. The standout courses were definitely the halibut and filet; and we would order them again if given the chance. It was quite the experience to dine on food from such prestigious chefs. Congratulations on 100 years, Benoit! This past weekend, one of my good friends was back in NYC; and needless to say, the food in LA just wasn’t cutting it for him. As a result, our weekend was planned around his favorite places to eat in the city. On a sunny Saturday afternoon, the wait at The Spotted Pig was about an hour for a party of 5. This was expected as they don’t take reservations. Inside, we were greeted with a bustling but warm and casual atmosphere. The entire restaurant has a nice West Village/English pub vibe with its modest wooden decor. All sorts of pig-themed pictures and paintings are strewn across the walls just in case you’ve forgotten where you’ve wandered into. 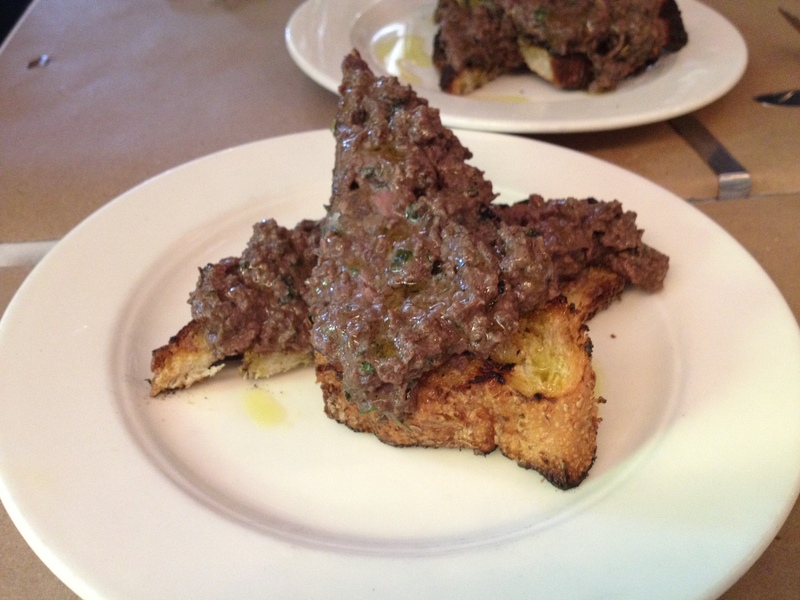 We started out with two orders of the chicken liver toast. I’ll note that it’s almost become a ritual for me to start out my meals here with this dish. The bread is toasted ever so slightly that the outside crust is crunchy, yet the inside is still a bit chewy. Then a heaping pile of rich and creamy chicken liver is spread on top. Visible chunks of liver also add another layer of bursting flavor to the dish. Absolutely delicious. I’ve been loyal to the burger the last four times at The Spotted Pig. And being one of my favorite burgers in the city, it was quite the predicament to go with something else, but I felt like I needed to venture out and try the rest of the menu. 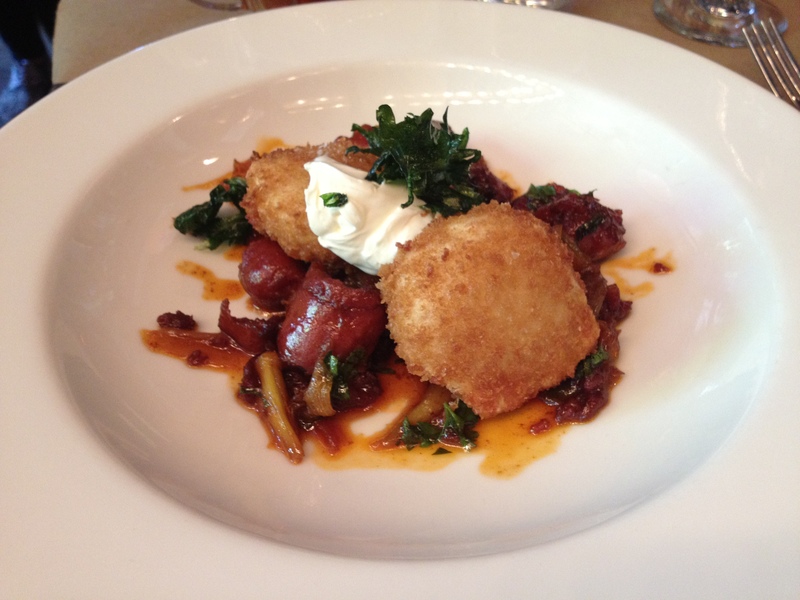 The deep fried poached eggs with chorizo stew caught my eye as an interesting dish when I looked over the menu for alternatives. A colorful plate of expertly fried (and) poached eggs sat on top of a chorizo stew made my Saturday afternoon even brighter. Sunny yellow yolk poured out of the eggs as I cut into them, adding even more color to the dish. The eggs complimented the salty, sugary, and vinegary stew well while the savory chorizo provided that extra hint of spiciness to bring all the flavors of the dish together. Almost every table around us ordered at least one burger and ours was no exception. Each juicy patty was cooked perfectly to requested temperature and came with a gigantic pile of salted shoestring fries on the side. 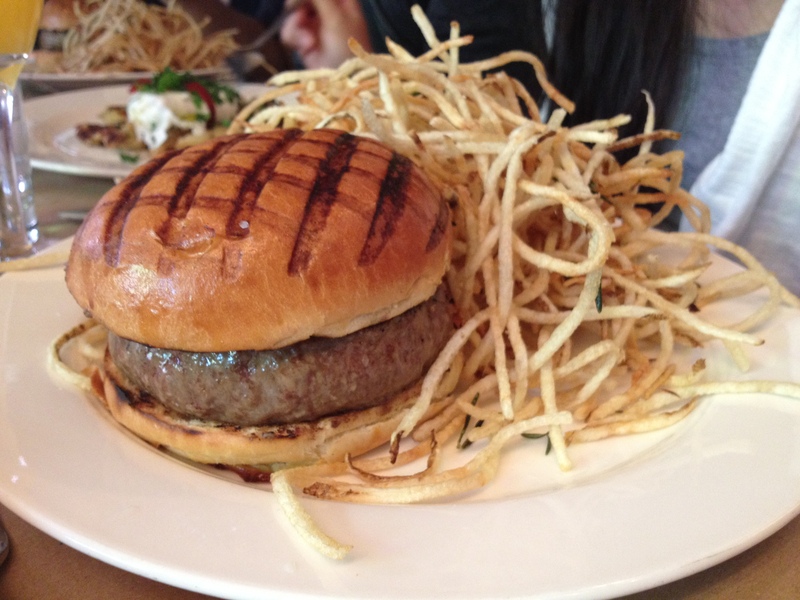 The roquefort cheese added an entirely new twist to the typical burger flavor, in a good way. Combined with a perfectly toasted brioche bun, everything worked together so well that almost no words were uttered during the consumption of the burgers. Only the sound of chewing and the occasional gulp broke the happy silence. If that weren’t enough, I’m pretty sure their shoestring fries were fried with fresh rosemary and garlic to give them such addicting flavor and aroma. The Spotted Pig is not only a solid choice for dinner, but also for brunch. Great food and great ambiance easily make this a favorite spot for any occasion. I highly recommend the burger and will be back soon to fill the void that was created in my stomach by not getting it this time around. Cheers! For one night only, on May 3rd, New York chef talents and 2012 James Beard Awards Finalist Michael Anthony (Gramercy Tavern), Michael White (Osteria Morini, Marea, Ai Fiori), and April Bloomfield (The Spotted Pig, The Breslin, John Dory), join ours truly Chef Philippe Bertineau and Chef-Creator Alain Ducasse, to prepare a unique and festive five-course menu to commemorate Benoit’s 100th Anniversary. Twenty-five percent of proceeds will be donated to Robin Hood Foundation.